Northern Ireland-based haulage, storage and distribution specialist, Mulgrew Haulage Limited, has seen 13 of its drivers achieve an average 11 percent improvement in fuel consumption since beginning remote driver coaching with Scania three months ago. While the service can be purchased as a stand-alone product, Mulgrew Haulage is taking advantage of the four complimentary coaching sessions offered to all retail operators opting for the inclusive repair and maintenance package provided with most new Scania trucks today. "The figures being achieved here clearly demonstrate a win-win situation for both parties," says Paul Johnson, Scania's General Manager – Connected and Driver Services. "For a company operating 125 Scania trucks an 11 percent fuel saving is hugely significant, while better and smoother driving means reduced wear and tear and fewer premature failures. That is not only good from a repair and maintenance provider's point-of-view, it also benefits the customer by increasing uptime and enhancing their total operating economy. The coaching sessions are performed remotely and efficiently, meaning that they do not absorb too much time. "The majority of Scania vehicles today are supplied with a repair and maintenance package. This means the operator has access to our Control 10 service, which provides not only tracking every ten minutes, but performance updates in real time. Our specialist driver coaching staff work with this data to help drivers improve their performance behind the wheel, and sustain those improvements over the long term. Four coaching sessions are provided free of charge, and I would urge all operators to ensure they use this service – the results speak for themselves. For any customers without a repair and maintenance package, your local Scania dealer will be pleased to advise on how you can also benefit from the service we offer." As an operator engaged in long-distance haulage, Mulgrew Haulage Limited is keenly aware of the need to minimise fuel consumption. " Commercially we need to be competitive and constantly monitor all our costs, fuel economy is at the top of this list," says Dermot Mulgrew Jnr. "Customers do not pay for our inefficiencies, they depend on us to provide a cost-effective and sustainable service. As professional operators we also have an environmental responsibility to think of. With the complimentary training sessions offered within the repair and maintenance package Scania help us to improve on both these fronts." For Road Trucks Limited, Managing Director John Marks adds, "We are delighted to see the significant savings being realised by Mulgrew Haulage. The firm has a further 70 trucks on order for 2019, and we look forward to helping their drivers maximise the return on the company's investment in Scania. In a broader perspective, Scania's Driver Services team have a proven track record of success and I would encourage all operators, large and small, to avail themselves of the service in order to help their drivers realise the financial benefits that come with better fuel efficiency and reduced wear and tear." 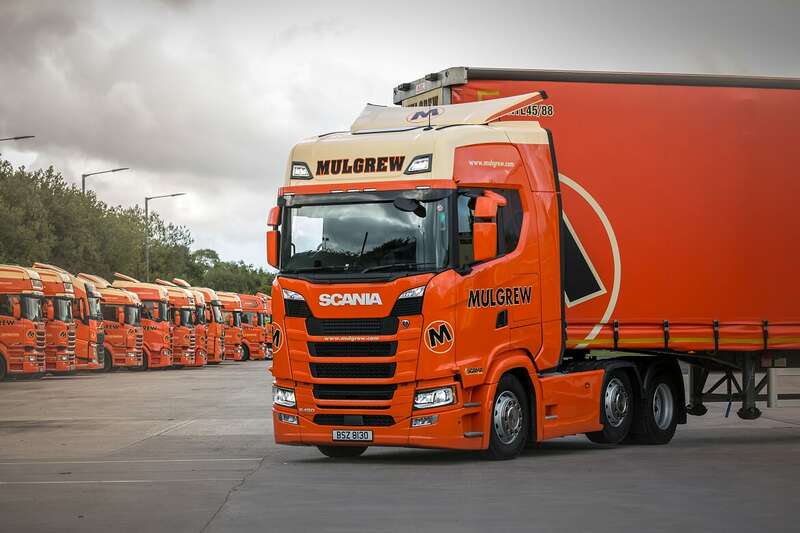 Mulgrew Haulage Limited is engaged in haulage, storage and distribution, including a full pick and pack service, and is a long-standing and large user of Scania trucks. Acquiring its vehicles from Road Trucks Limited, Scania's Larne-based dealer for Northern Ireland, the company currently operates a total of 50 new generation Scania S-series trucks powered by a mix of 13-litre and 16-litre V8 engines. In addition the firm operates a total of 87 R-series Highlines and Toplines from Scania's previous generation of vehicles.